Surrounded by Chicago teachers, Karen Lewis responded to the city's demand that teachers pay 7 percent more towards their pension payments — with some fighting words. “To take a 7 percent pay cut is strike worthy – yes," Lewis challenged during a Friday afternoon press conference. 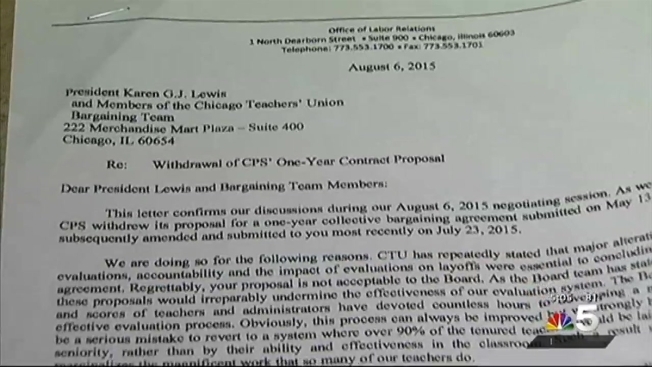 The teachers union says it was close to a new one year deal, but that all changed this week due to what Lewis said was Mayor Emanuel’s new team that just took over at Chicago Public Schools. For a teacher making $55,000 a year, the city’s recent proposal means a $4,000 pay cut. Lewis met privately with Mayor Rahm Emanuel Sunday, and the union thought they were close to a one-year contract – with no pay hikes – but not anymore. Now CTU is blaming new CPS CEO Forrest Claypool. “Sherriff Claypool has decided just blow things up and show how tough he can be,” Lewis said. A recent letter from CPS to the teachers union noted a disagreement over the pension payment – and if layoffs take place – CPS wants to make those layoffs by teacher evaluation, not seniority. Claypool is pushing for Springfield's help for a bailout, but Governor Rauner has said no to special deals for Chicago only. It was three years ago that Chicago teachers walked off the job in mid-September. This time, if there is a strike, it won't happen for several months. First the CTU is asking for a mediator, something CPS has yet to agree to, according to the union’s attorney Robert Bloch.